Mounting clamp allows using TAL65 OTA on EQ mount or any Photo Tripod. 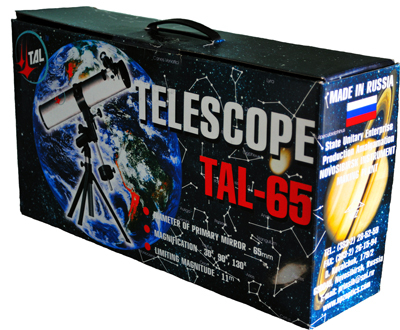 TAL-65 is a 65mm (2.5") amateur Newtonian telescope for the beginner that brings high-quality glass optics with no compromises at an affordable price. This telescope uses 0.96" size Eyepieces (plastic housing with full glass optics) and includes everything you need to make it work right out of the box, except the mounting tripod. 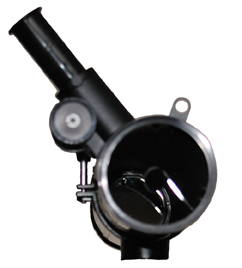 Aluminum focuser and steel OTA construction makes this telescope very durable and gives it a solid feel. Magnification achieved with supplied accessories are 30X, 90X, 130X. OTA tube length is 470mm. An English manual is included with the original factory box. Total Weight about 5 lb. Enjoy night observations as well as solar with supplied eyepiece sun filter. OTA has internal light baffles all along its surface for superior optical performance.